The partial government shutdown that began after funding ran out on midnight Friday is affecting hundreds of thousands of feds in the middle of the winter holiday season. Congress is not set to return to negotiations until Thursday, so many feds took to Twitter to share the stories of their lives during the shutdown over Christmas. 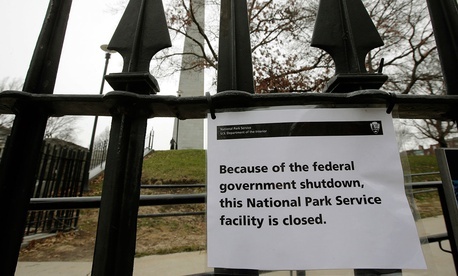 Using the hashtag #shutdownstories, Twitter users—many of them feds—wrote about how the partial shutdown affected their lives. The trending hashtag appears to have been started by @TeaPainUSA, a "humorous" Twitter user with #resistance in his or her bio on the social media network and a username that is both a pun on a rapper and references the Tea Party movement of the earlier part of this decade. @TeaPainUSA, asked for replies with the hashtag in a Sunday night tweet. If you're bein' affected by the #TrumpShutown, drop Tea Pain a tweet with your story and he'll retweet ya. Use the #ShutdownStories hashtag. Sound good? Some users voiced their frustrations with Washington, while others lamented their dire financial circumstances created by the shutdown. (The Office of Management and Budget noted earlier that paychecks scheduled to go out on Dec. 28 would go out as scheduled.) The hashtag so popular that it was a trending topic on Twitter in the United States for much of Christmas Eve and Twitter featured it as a "Moment." Haven't bought Christmas presents yet, cause we knew this might happen. Cancelled the trip to spend Christmas with family, cause I got leave cancelled. Got some savings. Got some credit cards if really necessary. #ShutdownStories Co-worker and I are contractors for the govt. She has NO vacation or sick time left because of illness in family and now, if this goes too long, will have NO paycheck coming in. And my company has no policy to donate leave. I really hate this admin.